I recently found an app for the iPhone and iPad that is a true joy! 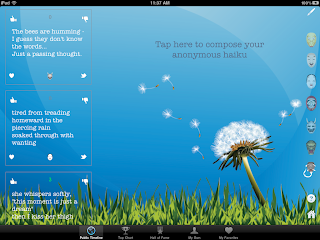 I don't even know how I happened upon it, but I discovered Haiku Wind for the iPhone and Haiku Wind Pro HD for the iPad, and I have been using it frequently since. Billed as "A poetry game for the Twitter generation", it's a really well done app. Now I do NOT fancy myself a poet, but this app lends itself to use by anyone, of any poetic skill level and any level of interest. With it, you can view the Public Timeline, see the Top 100, check out the Hall of Fame, review your own Haiku or just look over some of your favorites. It's a brand new app, and the community is small for it right now (looks like about 300 users from their statistics page...and I became one of the first ten Haiku Gods! ), but it's taking off fast. There's a lot of great enjoyment to be had just by reading the Haiku on their web site, which is considered to be an important aspect of the app. The app allows you to earn your way, via public voting on your anonymous Haiku, to a "Haiku God". The final of many levels based on the number of votes you get. The higher level you are, the more votes you can cast for a single Haiku. I'm not certain, but it sounds like once you make the "Haiku God" level, you can't lose that status, although you definitely can on the way up! I lost my status at one point after taking a severe hit on one of my Haiku that must have not been popular. It had a mis-spelled word (darn iPhone correction!!) and I think I got voted off the island because of that. Anyhow, why am I writing about this Haiku app on my Weight Loss and Self-Improvement blog? Well, because I found that it has some real serious benefit in terms of mindfulness efforts! As we all shoot for Mindful Eating, Mindful Living (as we learned from "Savor "), and general Mindful Practice it can sometimes be difficult to focus. It's easier during meditation, but with all the distractions of a day pressing on us, it's not always easy to be mindful. That's where Haiku Wind Pro HD (or the iPhone version) seems to aid us. I have found that if you pick a topic you want to be mindful of, and compose a Haiku about it, you are rather forced to think only about that thing and how to best describe it in ample detail, with few words. This is exceedingly more difficult to do than you might think and - at least for me - helps you clarify your own feelings on the thing in question. Not to mention it is relaxing and beautiful at times. A variety of beautiful backgrounds are available in-app. A look to please most anyone! For you Buddhists out there (I did haiku on the Four Noble Truths! 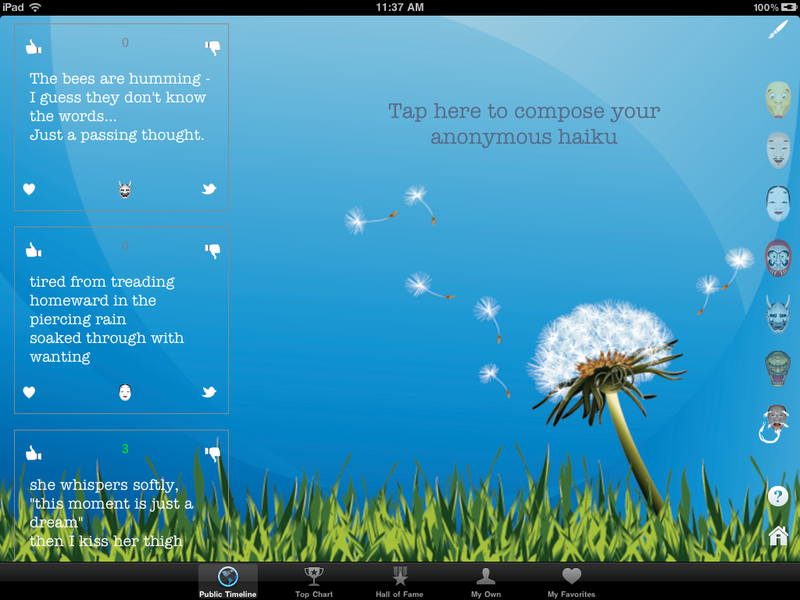 ), this app does not require an account, and while you do retain a list of your own Haiku, the app is anonymous. You get no recognition for them, so no one knows which ones belong to whom. This means you aren't attached to them, and therefor they offer a nice lesson in impermanence as well. If you're not Buddhist, this could be a put-off for you, but I think it's a lesson well needed for most folks in this day and age. So check out Haiku Wind Pro HD for your iPad or Haiku Wind for iPhone. It's a really nicely designed app, with a tiny bit of room for enhancement, but it's nearly perfect! As with all my favorite apps, it is a single function app that does one thing very well and looks great doing it. It's a pleasure to view as well! I want to give you the world! For you gave me mine. as daylight fades to darkness.